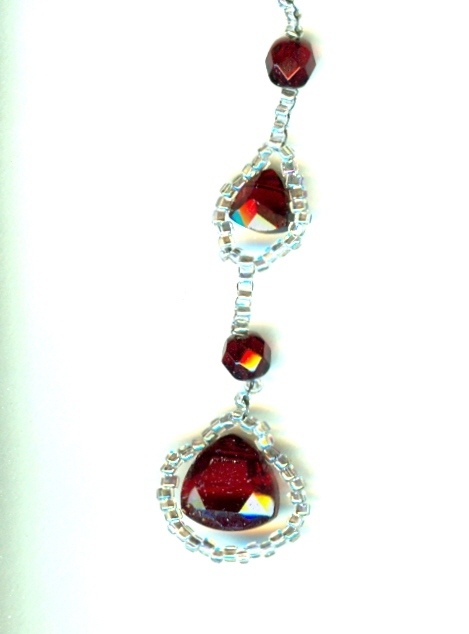 This garnet glass lanyard makes a great small gift ? even to yourself! Use it as a decorative zipper pull, or dangle it from a belt loop, or use it as a handle for your cell phone. The beads are vintage faceted West German drops and lustred clear seed beads, all sewn together with stitches of steel (would you believe ? multiple passes of very strong thread). The lanyard measures about 5-1/2 inches all stretched out. When affordable beauty is what you crave, look no farther than SPARKLE PLENTY.